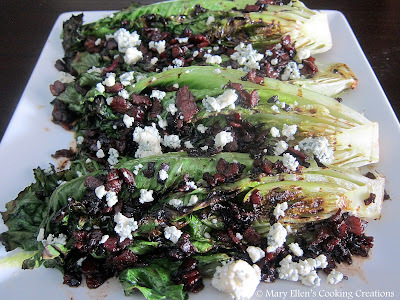 Have you ever grilled Romaine lettuce? If not, you must try it. The Romaine chars nicely and only slightly wilts, and gets a smoky and bitter flavor. 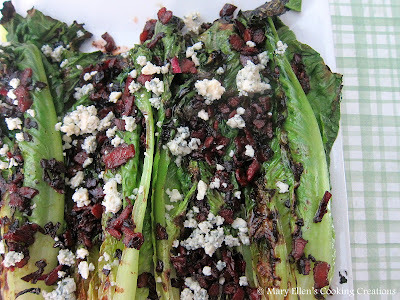 Jon commented that grilled Romaine actually takes on some flavor - it's an otherwise boring green. But grilled, it's fabulous. I saw this Guy Fieri recipe for Grilled Romaine with Blue Cheese-Bacon Vinaigrette and knew we had to make it. Bacon makes everything better! Bacon and blue cheese are a perfect pairing in my opinion, and when you mix in the balsamic over heat, you get a smoky-sweet-sticky dressing. My mouth is watering just remembering this dish! 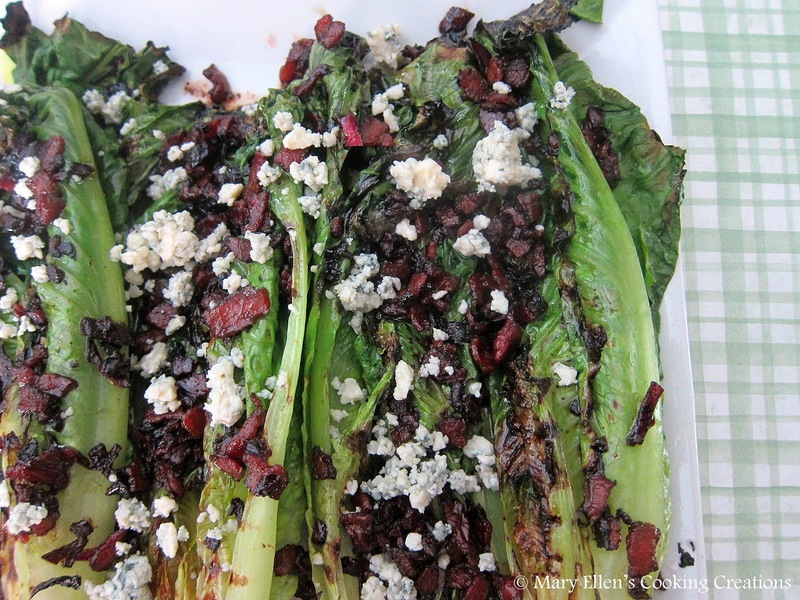 I recommend you serve the dressing warm over the Romaine as soon as it comes off the grill. Brush the Romaine with just a touch of oil, or spray with olive oil (I love my olive oil spritzer!). Place it on the grill cut side down, and quickly sear. This took about 3 minutes. Pour the bacon-balsamic dressing over the lettuce, sprinkle with blue cheese, and garnish with additional freshly ground black pepper. Thanks for linking in to Food on Friday Salad. Have a great week.